A trip on the Pumpkin Patch Express yielded a pumpkin for everyone. Chere Simmons photos. New York to Florida (Miami) rail service on the Orange Blossom Special began in 1925. Its owner was hoping to lure influential and wealthy people to a Florida he deemed ripe for development. This locomotive now rests at the Parrish museum for all to enjoy. Going back in time is easier than you might think. Not literally, but certainly figuratively. Surround yourself with trappings of a bygone era — like boarding a clanking, rocking railroad car — and your mind can easily imagine what long-distance travel was like in the early 1900s. 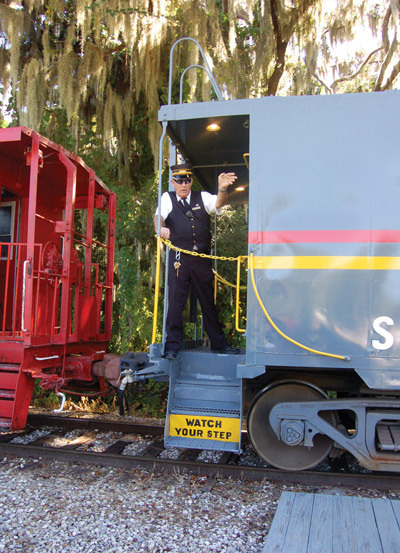 The Florida Railroad Museum in Parrish is keeping man’s romance with the rails alive with weekly train rides and special events throughout the year. The museum and train depot are located in Parrish, just 12 miles south of S.R. 674 on U.S. 301, in Manatee County. 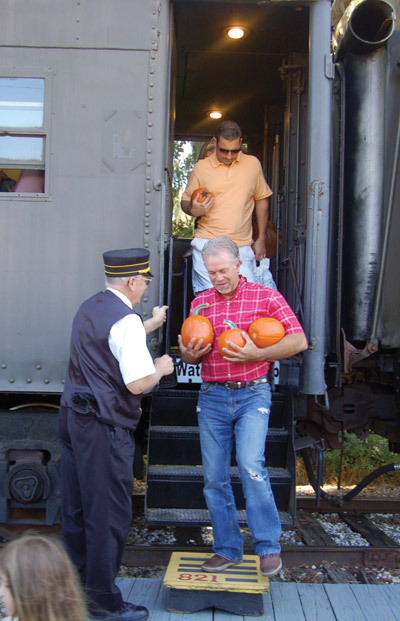 As of Oct. 26, the museum’s Pumpkin Patch Express concluded its seasonal event, which entailed a 30-minute train ride to a rural area where a festival atmosphere was created by local clubs and organizations. All of the museum volunteers were dressed in traditional railroad uniforms that made the experience come alive from the moment you embarked up the steep steps of the train car. At the end of the line was the Pumpkin Patch, where visitors were treated to hay rides, a hay maze, numerous crafts, sack races, the choice of a pumpkin to take home and more. All this was included with the ticket. The coach-class ticket affords you open-air seating, which is the best way to experience what it must have been like to travel in Florida by rail in those days. The scenery was lined with farmland, pine-tree stands and palmettos. The way Florida looked to early visitors. For a slightly higher fee, you can upgrade to an enclosed car with air conditioning and club seating. Once the train begins moving, passengers are free to walk from car to car, stopping in the flexible gangway connections to watch the tracks zip by beneath their feet. 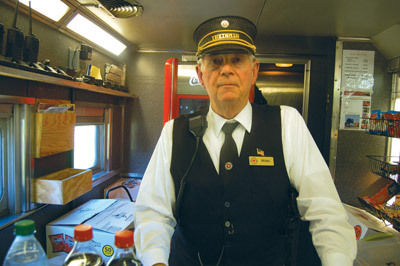 Volunteers at the Florida Railroad Museum dress in traditional railroad uniforms to make the experience as authentic as possible. After an hour at the Pumpkin Patch, it was “all aboard,” and the train rattled back to the station with happy, relaxed passengers of all ages. Judging by the ages of the passengers on this sold-out Express, it’s likely that most had never experienced travel by railway. Passenger travel began to decline in the 1920s and frequent rail travel had ended by the 1960s. Trains helped to establish new towns throughout Florida and played an integral role in the lumber, phosphate and agricultural industries. This heritage is kept alive through the Parrish museum. While en route, the trek to the snack bar was like a history lesson. Each coach had a unique style — the result of piecing several decades of train cars together, forming a jigsaw puzzle of train eras. 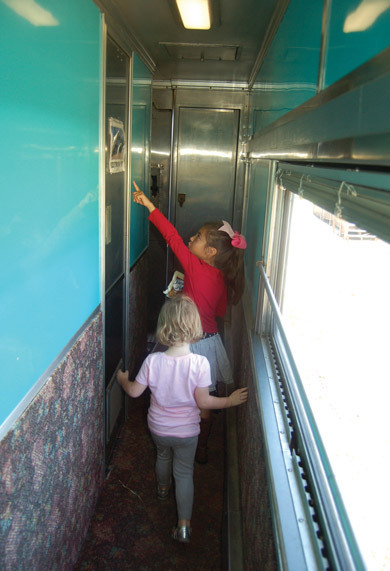 A bright turquoise sleeper car was indicative of the 1950s, and the brocade-upholstered dining car screamed 1940. For those wanting to reminisce about past train travel, or experience it for the first time, visit the museum’s website at www.frrm.org for more information. Upcoming events, other than the weekly excursions, include von Kessinger’s Express on Nov. 15, a World War II adventure through the French countryside; the Hole in the Head Gang Train Robbery, Nov. 30; and the North Pole Express on various dates throughout December. 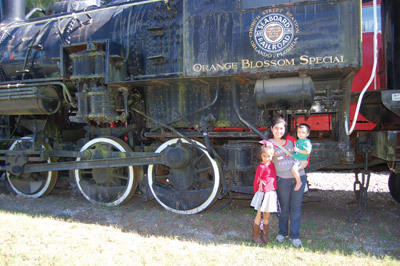 The Florida Railroad Museum is a nonprofit 501(c)3 organization. 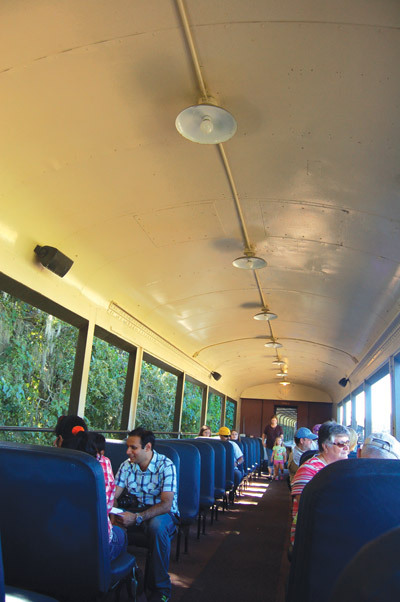 This open-air coach felt a lot like riding on a school bus. The original industrial-looking lighting see here has become popular again in today’s decorating themes.